You can view Prof. Carel IJsselmuiden’s keynote address at the opening session of day 2 at the 6th PNHRS Week – by accessing PNHRS Week’s website. Click on the image below to access it. Carel IJsselmuiden, the Executive Director of the Council on Health Research for Development will on Thursday this week, deliver a keynote address at the opening of the second day at the 6th Philippine National Health Research System Week (PNHRS Week). In his address, COHRED’s Executive Director will highlight the benefits of COHRED-led projects such as Health Research Web and recent initiatives such as Youth in Motion and how they can be used by young scientists and researchers to create knowledge and partnerships that can sustain research and innovation for development. On making his remarks, he will then go on to participate in a press conference. The event, which is pushed for by health research stakeholders and is co-hosted by the Metro Manila Health Research and Development Consortium, will be held at the Sofitel Philippine Plaza, CCP Complex, Pasay City from 8 -10 August 2012. The PNHRS Week is held annually in the second of week of August. 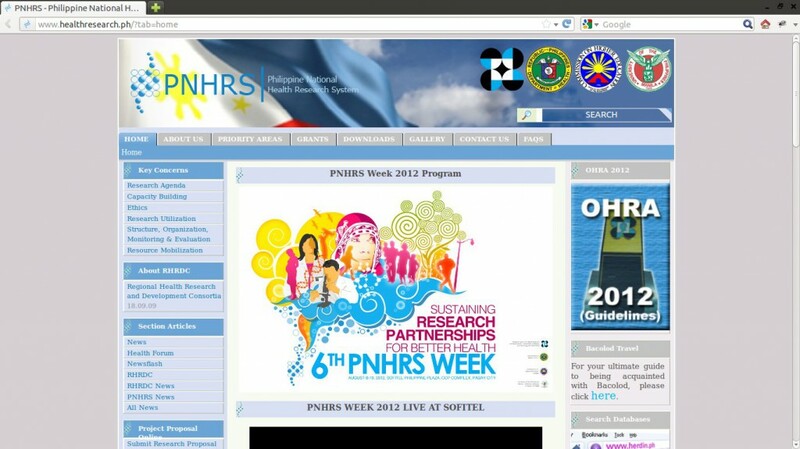 The theme for this year’s PNHRS Week is: ‘Sustaining Research Partnerships for Better Health’. The Week provides a platform for the different stakeholders in health R&D to interact, to learn from each other, to share information and experiences, to voice their concerns and to contribute research-based solutions to health problems, among other things. Part of the aim is to come up with outcomes that can be used to support the country’s Kalusugang Pangkalahatan agenda. The PNHRS Week will also bring in the consortia chairs and committee chairs so that they can participate in parallel sessions on R&D agenda, capacity building, research utilisation, ethics and governance. There will also be plenary and concurrent sessions on topics relevant to strengthening health research collaboration. More than 600 participants from all the 17 regional health research consortia of the Philippines are expected to participate in the event. You can view Carel’s blog postings by going to our ‘Director’s Corner‘.